The cult zombie team of Zomblogalypse have wrapped principal photography on the feature version of the comedy horror web series. The movie - a co-production between MilesTone Films, One&Other Creative, Grunt Productions and Whixie Flix, was shot over the course of the summer in and around York, taking in nearby locales such as the Golden Ball pub, the Ritz Cinema in Thirsk and York city centre, through which our heroes speed in a American muscle car, with hundreds of zombies falling prey to the trio’s menagerie of weapons. 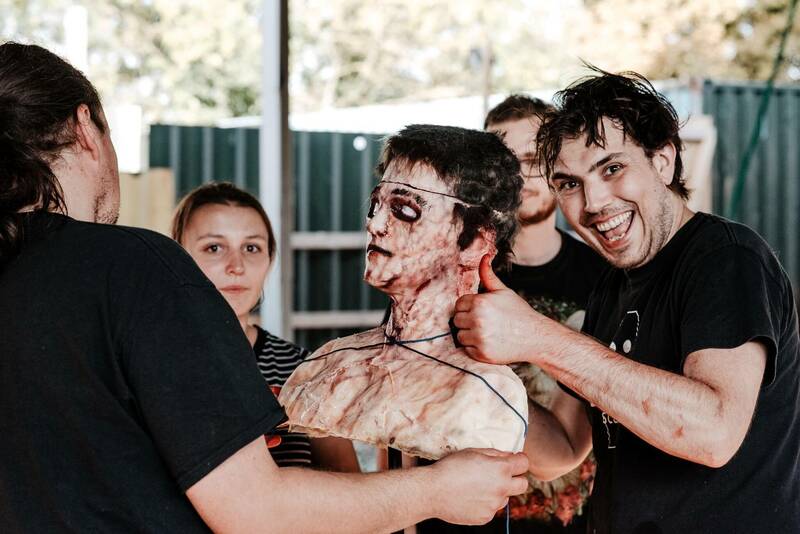 For co-creators and directors Hannah Bungard, Tony Hipwell and Miles Watts, who play the three hapless survivors of a zombie apocalypse, the movie has been a real labour of love. Originally developed through a sales agent and Hollywood film studio, the team made the film independently working with some of the cast and FX crew of their friends’ Dark Rift Films, who scored recent success at FrightFest with the comedy horror Book Of Monsters. Zomblog the movie was shot mostly in York - including Bishophill, York Library and the old Environment Agency building which both doubled as the Zomblog flat interiors and exterior, and York Maze Hallowscream, which served as the location for a major action sequence. The anarchy of the shoot also bled into the filming techniques used by the crew. “The film is incredibly meta and demanded a number of different cinematic styles so we used a wide range of cameras to communicate the different viewpoints,” says Tony Hipwell. “We've primarily shot with the Panasonic EVA1 and GH5 as well as GoPro and Mavic Pro. The original series had a very frenetic, unconsidered quality to it that we wanted to honour, but at the same time evolve for the big screen so we've adapted the found footage approach of the series in some really interesting ways." The film now goes into post-production until spring 2019, when the Zomblog team are planning a weekend or two of pick-ups, to shoot extra scenes and fine tune the edit. “We've got the bulk of the film in the digital can but there's one big sequence in particular we're saving for the new year that will be a lot of fun as well as some smaller scenes we realised we needed whilst shooting, on top of anything the rough cut reveals” says Tony. Keep up to date with the movie’s progress and watch the web series at Zomblogalypse.com as well as the Facebook page which is now a 2500+ strong community.